We received the second printing of our Womanrunes book this week! They arrived a week ahead of schedule and look beautiful! I’m thrilled to move forward with promotion and distribution of the book. It was a true labor of love and it feels really powerful to share this work with others. 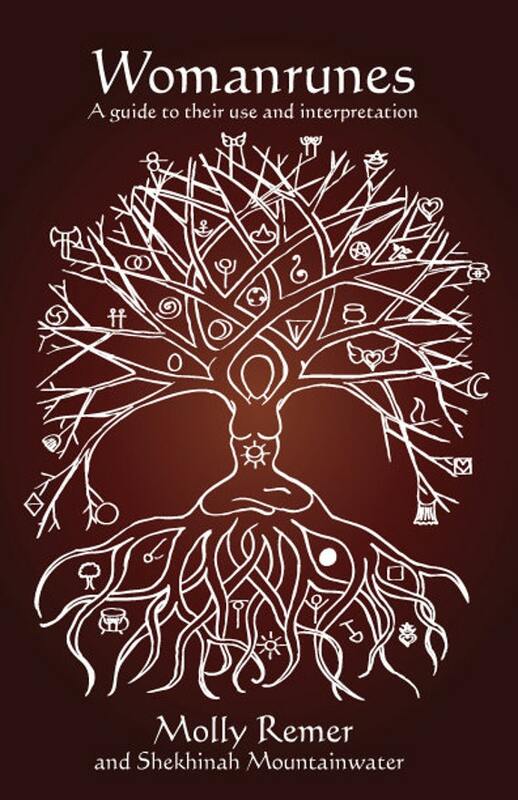 You still have time to get our free digital “Womanrunes Starter Kit” by signing up for our newsletter at Brigid’s Grove. (Scroll down a little and the subscribe box is on the right hand side after our etsy box.) We are also hard at work on a new freebie for our February newsletter, so make sure you’ve signed up and you will automatically get our free “How to Draw a Calamoondala” handout when the newsletter is finished. 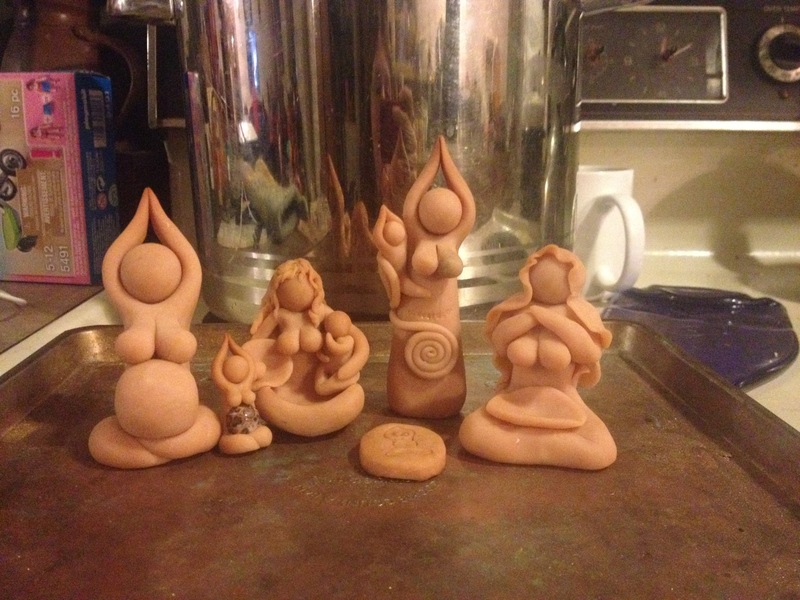 It has been on my list for some time to create seasonal goddess sculptures. I felt a wild burst of inspiration at the beginning of the month and created a ton of new sculptures! Only two of them are for the seasonal idea and the others are larger versions of my classic designs. I like the size of my original sculptures, because they fit nicely in the hand or on a birth altar, but I get quite a few requests for larger altar centerpiece figures, so I’m working on fulfilling that request. When I made these, I was feeling really ready to be done with holiday mode. After feeling excited and energetic about our many plans for 2015, I got up on New Year’s Day feeling crabby, depleted, unfocused, and somehow defeated. After trying to “force” more planning and more decluttering, instead I sat down with my clay and all these new prototypes came out! There is the bigger pregnant goddess people keep asking for, a pendant intended to hold a placenta stone (or regular gemstone), a repair to my cesarean birth goddess sculpt, a grinding-my-corn goddess, and a winterspirit/meditation goddess. After creating them, I felt so happy and excited and back to being recharged. 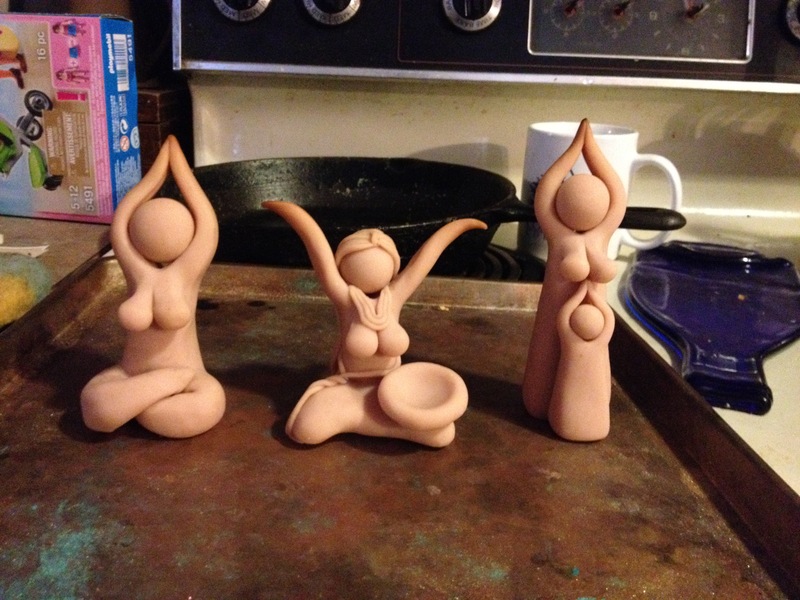 The next day, I created larger versions of my mama goddess and seated mountain pose goddess, plus a brand new springtime water goddess sculpt. The new seasonal sculpts are very tricky to mold correctly. We’ve only cast the “winterspirit” figure so far. And…she’s evolved again. When we finished her with my favorite red pigment, I decided she might not be Winter after all, but she might be a Red Tent goddess sculpture instead. The feeling she is intended to convey is appropriate for both the Red Tent and for Winter though—she is drawing inward and reflecting, but she is also open to receive or to share as well (with a built in offering bowl in her lap). We plan to have these available in February. Strength be with Mark! When I make something new, I want the mold ready like, NOW, and I can get really pushy and irritating about it. We are working through our new Shining Year in Life and Biz workbook from Leonie Dawson. I meant to do a year-end business reflections post, but haven’t had time for it yet and the moment may simply be passing, but I want to share that one of the most powerful (and humbling) things we learned from 2014 was that the idea is only 1% of the process, 99% is in the work and commitment that follows the idea. Many people never make it past the idea phase and as we closed out 2014 we took some time to celebrate and acknowledge the rest of the 99% of doing it, instead of just thinking about or talking about it. Here are some pictures from our epic planning day shortly after Christmas. The far away picture of the table shows what happened when we really got going! 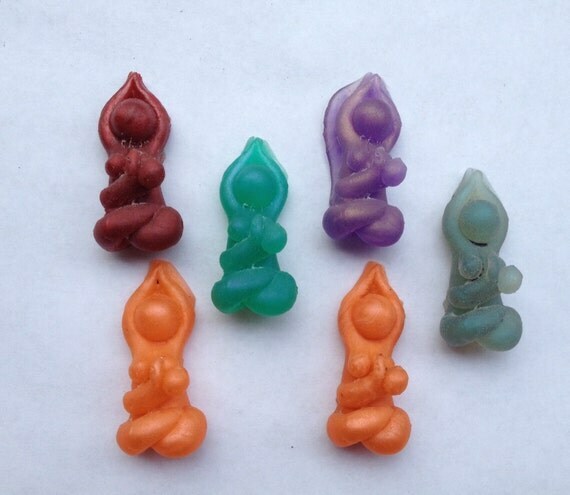 The candles are our new intention candles for 2015. We had fun making them! And, speaking of Shining Years, I’ve been meaning to post about keeping your pewter jewelry shiny. Mark hand finishes and polishes each of our pewter pendants by hand. After wearing for a while, especially if they are immersed in water (like being showered in), the pewter tends to become duller and darker. This is easily solved by just rubbing the pendant with a soft cloth or even just the hem of the shirt you are wearing! They brighten right up with just that simple buffing. 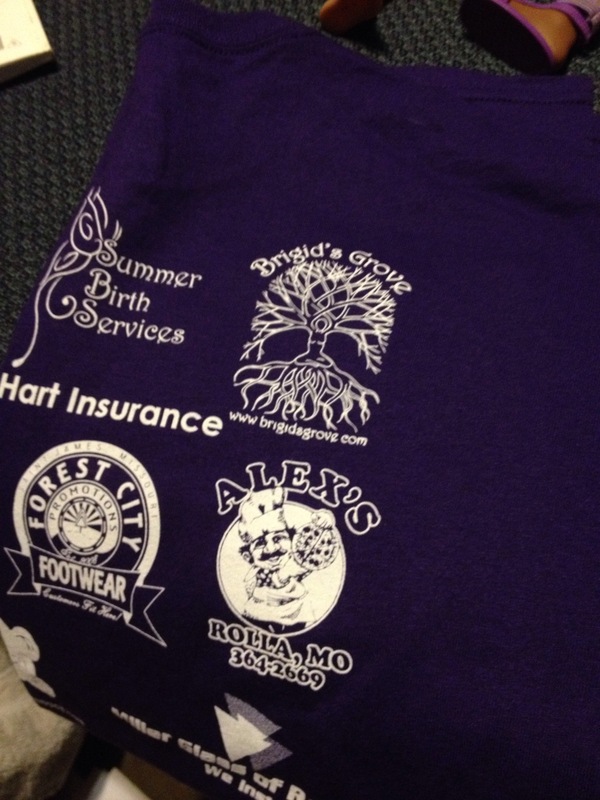 We’re happy to be a Gold sponsor of the StoneCrest Dance Center competition team. 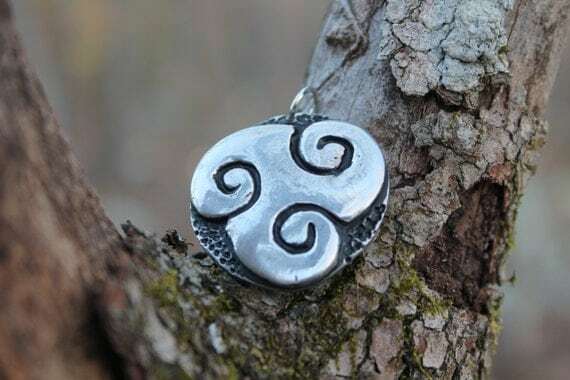 And, we’re clearancing out our large triskele design. Only $10! 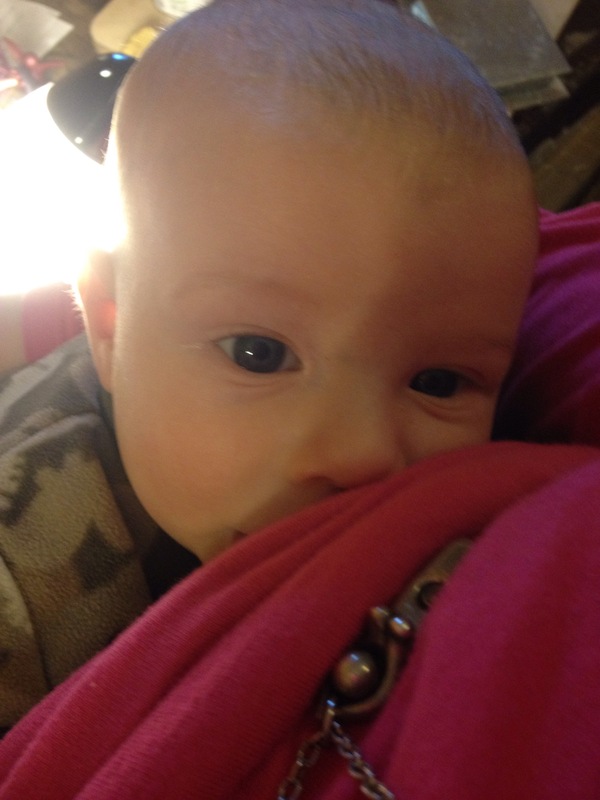 He started to play a little nursing game and after having laughed for the first time on January 2nd (seems quite early for laughing! ), he was actually cracking up today pulling away while I dipped him down and said, “moved your head!” I couldn’t get a picture or a video of it, but trust me, it was completely adorable. Here’s what we’ve been up to this month in life and creation!